Your might need your Support PIN to work with our support team. In case you can’t remember the Support PIN you set up when you created your account, it’s easy to find the PIN after you log in. Log in to your account, and click your name in the upper right-hand corner of the page. 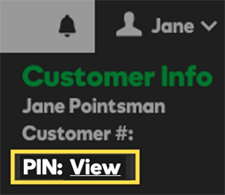 You can find your Support PIN in the Login Info section. You can find receipts for all of your CheapDomainRegistration.com purchases in your account’s order history. In your account manager, click the Account settings menu, and then select Order history. All of your account’s receipts display. If you want to find a particular receipt, click Filter by and use the options that display there. In your account manager, click Account Settings, and then click Renewals & Billing. Select the product or products you want to renew, and then click Renew Now. Be sure the credit card or payment method you select is still valid. Note: If you want to make sure your products renew on their expiration dates, you can instead turn on auto renew. You can add credit cards to your account that you can use to renew products and make purchases. When signed in to your account, click Account Settings, and then click Payment Methods. At the bottom of your list of payment methods, click Add Payment Method. If you forgot your IFindHost – CheapDomainRegistration.com account password, you can reset it. Note: If you don’t know your username or customer number, click I forgot. You’ll receive an email at the address on file with a link to reset your password in a few minutes. For your security, there are combinations of words and phrases you can not use in your IFindHost – CheapDomainRegistration.com account password. For example, you cannot use the phrase “password” anywhere in your password. If you try to use a restricted phrase, we will not accept your new password.